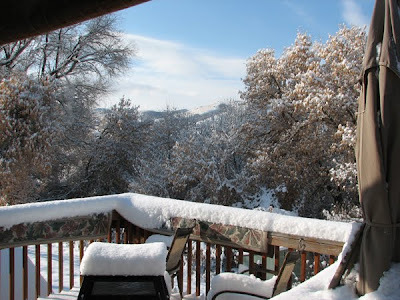 So, yesterday was a very snowy day at my house. Today, we have about 7-8 inches of white glistening snow and bright blue sky. As I type this, my husband is outside playing Fox and Geese in the yard with the older kids. Baby is at the window wanting to join them outside. I have had a cold and sore throat and so I am pretty much confined to the house. Maybe I can get some scrapping time in today. It is the perfect day for me to share with you the Winter Memories Window Mini Album that I created for the Cricut and Yourstory contest from a couple of weeks ago. This will be a little bit of a lengthy post because there are a few pictures and I have also posted the directions on how I created this album. Using the Cricut DesignStudio, place two 5 1/4 inch rounded corner squares from the George Cartridge 1/2 inch apart on the DesignStudio mat. Place a 5 1/4 inch tall rectangle between the squares and weld all the shapes together. Place a 3 1/2 inch rounded square inside one of the squares. Do not weld the smaller rounded corner square (this will serve as the window on the front cover). Cut the design out with the Cricut Expression from chipboard material with the deep cut blade and housing. The chipboard cover should measure 5 1/4 inches by 11 inches. Mark the cover in the middle at 5 1/2 inches. Score and fold the cover 1/4 inch on each side of this mark to create a 1/2 inch spine. Cut four 5 1/4 inch rounded corner squares out of cardstock from the George cartridge with the Cricut Expression. These will be used to cover the chipboard album. Using the Cuttlebug and the A2 Snowflakes embossing folder, emboss two of the 5 1/4 inch square covers (you may need to run them through twice to completely emboss them). Paint the embossed snowflakes with white acrylic paint and/or glitter. Adhere these to the outside of the album. Using a craft knife and self healing mat, cut out the window area on the embossed cardstock. Leaving enough ribbon at the back of the album for tying a bow, wrap ribbon around the middle of the back side of the album to the front and tuck it inside the window to the spine and adhere. Wrap another smaller length of ribbon from the inside around to the outside edge of the window and adhere, being sure to leave a good length for tying a bow. Adhere the last two 5 1/4 inch pieces of cardstock to the inside of the chipboard cover. Cut out the front window with a craft knife and self healing mat (being careful to not cut the ribbon). Cut a piece of cardstock at 5 1/4 inches by 2 1/2 inches and Score it at 7/8 inch in on each of the long sides making it ¾ inch between the scored lines and the sides at 7/8 inches. Emboss with the Cuttlebug and Swiss Dots embossing folder. Adhere to the spine and wrap around to cover 7/8 inch on each of the front and back covers. Using A Child’s Year cartridge and the Cricut Expression, cut out the boy and snowman image from cardstock at 3 inches. Cut the desired number of snowflakes from cardstock in various sizes to decorate the front and inside the album. Cut “Winter” from the Stretch Your Imagination cartridge from cardstock at 2 3/4 inches. Cut “memories” with the Graphically Speaking cartridge from cardstock at 3/4 inch. With the George cartridge, cut out the desired number of pages from cardstock in the rounded square shape at 5 inches as well as a little tag a 1 1/4 inches and the year set on shadow and cut at 1/4 inch. 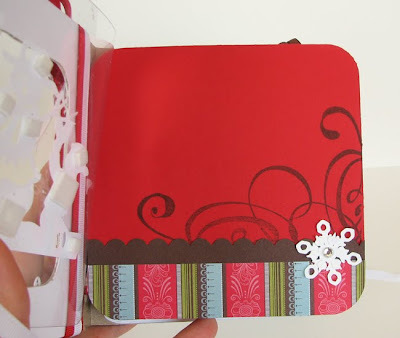 Decorate the pages with stamps, patterned paper and the snowflakes. 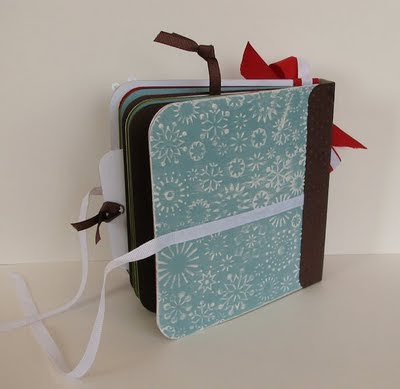 You may want to cut a couple of extras and adhesive on 3 sides (leaving the top or side open) and add to the back of some of the pages to create a pocket for a tag or pictures. Apply a thin bead of hot glue to the inside spine 1/2 inch from the top and bottom edges. Allow to cool. Place the pages inside the cover, being sure that they are even and 1/8 inch from both the top and bottom of the book. 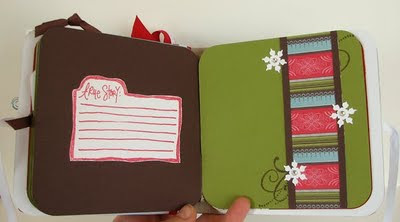 Place inside the prepared YourStory book binder and bind according to the directions. After it is finished, allow to cool completely. Apply the boy and snowman image that was cut with A Child’s Year through the window to the first page of the album for proper placement. 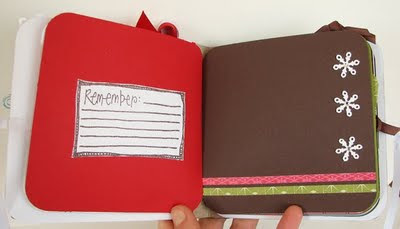 Finish decorating the outside of the cover by layering the Winter and memories cuts. Apply ribbon near the spine on the front and attach the 1 1/4 inch tag to the ribbon. 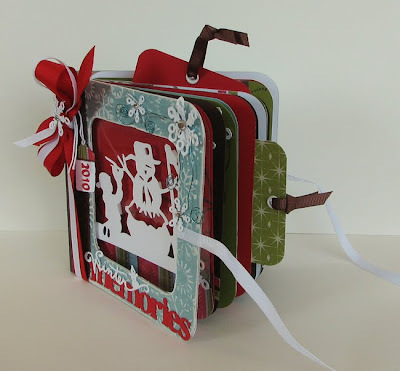 Add curled crafting wire to the front cover and decorate with layered snowflakes. Apply rhinestones to the centers of the snowflakes. Now you are ready for your family's winter photos. Congrats Sara!! Please EMAIL me your info so that I can get your package sent off to you. Thanks for stopping by and I hope you have a wonderful day!! WOW...your backyard is just gorgeous...I wish we got more snow here where we live!!! Your album is so nice...love all the little details!!! HI Ami, Beautiful album and such excellent directions too.